Completely agree, the merc trim is so much better. I wouldn't mind swapping the trim pieces, but I'm not one for wanting to put holes into the new panel. I know the trim at the bottom of the Mercury good has little holes for where little bolts go to hold it in place in combination with those trim retainers. I'll have to think about it since it wouldn't be there forever. The eventual plan would be to have the car painted (most likely a few years down the road), but the two tone job would be dropped and the trim work that surrounded the wood grain would be deleted and any mounting points and holes would be filled and smoothed. I will be attempting to generally match up the two tone so the replacement panel doesn't stick out too bad. I've seen a dark color called Cordovan Brown which could be used where the wood was, but replicating "sunburnt old gold/bronze paint" will be the fun part. There's some sandy gold colors I've seen that could be close to match the faded stuff, but I've also seen a color called Camel that looked like the stuff on the hood. Should be interesting to see how close I can get it. I hear of people always suggesting bringing in a piece of the car they want to get paint for and having the place scan it with some fancy machine and then they can mix up a batch of paint and in some cases even place it in a convenient aerosol can for you. I just have trouble finding those places though the idea sounds super appealing. May be something worth putting some effort looking into for your camel/sandy beige paint. No idea what piece of the car you can easily remove and bring inside for the 'procedure" at the paint shop...Maybe hack off a piece of the old tailgate??? The fuel fill door would do for that. Fairly small and easy to remove. That would definitely solve one of the two colors he is after. The metal "spring" has some tension. Boinggggg. We can always borrow the good motor from the damaged door and rebuild the other too keep for spares. Everything was working just fine previously. I'm surprised that facility was sitting on that one for so long. I bet that interior is on a special level of destroyed. From what I can tell between the Ford and Mercury tailgates is that the Ford ones got an extra hole on each side for the trim that ran vertical on the sides. Those can be filled and it appears the Mercury trim should be swappable from the damaged tailgate. I've saved the old trim and retainers should anyone want that stuff. I also took of the Ford emblem (was falling apart and cracked) along with the old dealer emblem. There's some rust on the lower corners, but some rust inhibitor, filler, and paint should solve that. I'll chalk it up to sitting in a junkyard. Next steps will be sanding down the area where the wood grain was (someone attempted to apply paint over whatever finish was left at some point) and cleaning the rest of the door of dirt and debris. The black trim that is near the window will also get resprayed since it's rubbed off in some spots. Overall, it shouldn't be too bad getting it ready to go on the car. Hopefully I'll have a free day on a weekend so maybe Nick and I both can work on it. It's much better than the torn thing that was back there. The seat belt situation worked out pretty well, except I wish I had fully removed those little support arms for the center seat belt. Also, the car seems netted an average of 17 MPG over the distance of 300 miles on a tank of gas. I'm fairly happy with that given the mix of interstate and city driving it has seen. Unfortunately I think the oil pan gasket does have a slow seep since it was 1/2 a quart low this morning before I got on the road. Otherwise, for about 450 miles in the first month, it has performed very well. If you have the means/tools please cut the rust out that is there and patch it with new metal. If not please at least use a fiberglass reinforced filler on the areas in question. Its less susceptible to moisture and may make the job hold out longer than if you used regular body filler. Normal body filler can and should be used for the final wipe though as fiberglass reinforced ones are quite difficult to get smooth. Also, cake the back side of the repair area with oil. It does help. If this is a lip or seam spray the oil inside the panel and it will sit/seep into the area and help slow down the inevitable. 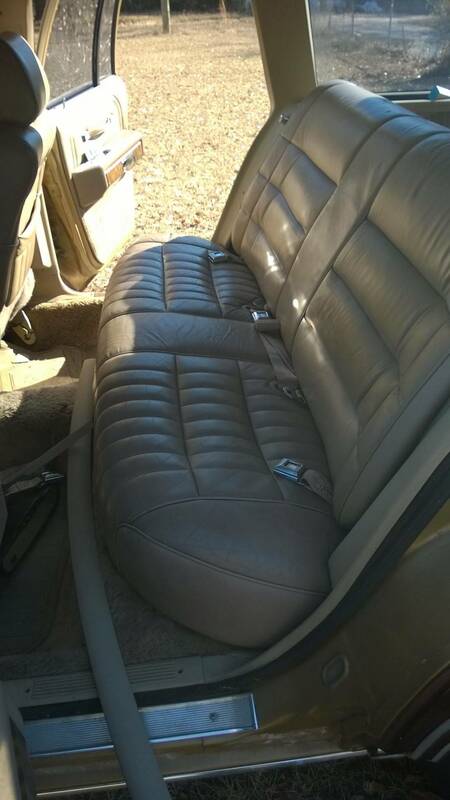 I need to find me a nice pleather or velour interior to swap into my car. My pleathers toast. Last edited by 87gtVIC; 01-24-2017 at 08:40 PM. Does it only have lap belts in the back? Weird. Well, I guess it just looks weird to me since the only wagons I've spent much time with were '90-'91s. As far as installing the Colony Park trim on your "new" tailgate, who says it needs to be clipped on? Why not just use trim tape and avoid drilling holes in the first place? I know that's not how Ford did them, but if my options were drilling into a hard to find bodypanel or using tape where you'll never know the difference, I'd totally use the tape. I wonder if my buddy saved any of the Colony Park trim I pulled from the junkyard to replace damaged parts on his '91.. 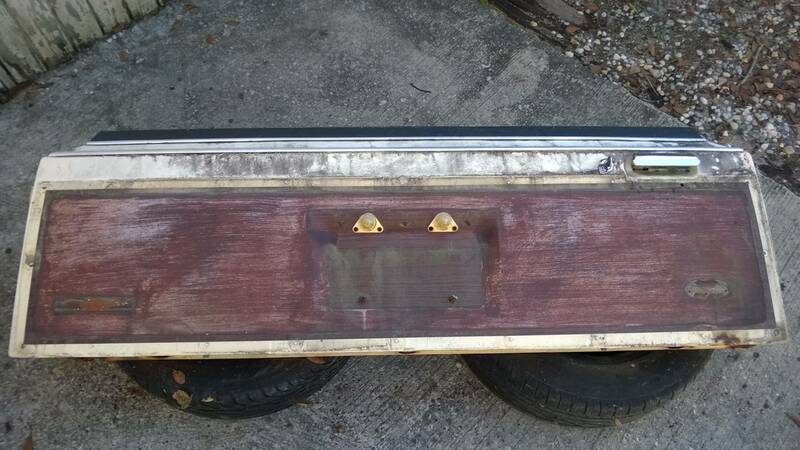 There was a very very rotten '86 (IIRC) in the junkyard with pristine trim on it and I salvaged most of the side trim from the rear doors back, including the pieces that wrap around under the tail lights. Don't know whatever happened to all that, he moved and the wagon was scrapped (too much rust and too many problems to move it). Yeah, my 87 also has lap belts only in the back. Did not know the seat bottoms would interchange. Or at least fit. How much persuasion was required? Your MPG is right on mine for the 88. Oil consumption too. Yep. Found these to be rather weird considering the buckles are outboard mounted but the belt retractors are inboard mounted. The passenger side retractor housing is deteriorated, so a rubber band is kept near the buckle so it doesn't slide under the seat. The driver side one is fine. I may grab a replacement one if I find one. The Colony Park trim should actually just interchange onto the new door using the existing mounting points. I actually need to remove two holes since they aren't present on the Colony Park tailgate. The lettering will be trim taped on since the holes that were used for mounting the badging are not the same. If I removed the little holders for the center belt, I'm sure it would have gone in easier. It otherwise went into place just like any other Panther seat I've removed. I tried to see if the MPG would be any different at 65 MPH versus 75 MPH. Nothing really discernible. Curious as to where Ford pulled that 27 MPG figure from, lol. I never expect to see such a number, but I'm always interested to see any change. As far as the oil is going, at least it isn't being burned, just a small leak. With a replacement oil pan gasket, I'm sure that'll curb that business. 55 mph downhill with tail wind probably. Well you're down to...oil pan gasket, crank seal and rear main as the leakers. the Rest should be dry. Definitely 1000000% recommend short hair fiberglass to treat the rust spot I saw on the Driver side of gate. You guys aren't going to believe this probably but at 65mph and 85% of the miles being covered on flat roads my Townie averaged 23.5 mpg. I was quite surprised. Test done by filling tank waaay past capacity, such that there is gas standing in the filler neck. Was able to cover about 360 miles until the gas light came on and then went another 20 before filling up. This was on Exxon gas, which seemed to be clearer/cleaner than the yellowish Shell gas I was using. Maybe it had less ethanol in it but the pump did say it would contain up to 10% like all other gas stations I visited on our Florida trip. Most miles I've pulled out of a tank of gas yet. On the whole 1300+ mile trip back I did not have to add any oil. it did burn some but we got it changed while in FLA and since they overfilled it I just let it burn off the excess. When we filled up in ohio for the last time it was at the top of the full mark. On the way down to FLA I only had to add about a half quart total. Last year the car burned nearly five quarts to get us there and back. Differences this time around were I used that Restore stuff and two cans of BG44k fuel infector cleaner, oh and 10w-30 instead of 5w-30. I really think the Restore cuts down on oil consumption a lot. Way better than the 9-10mpg I've been getting. I nreally need to figure this out at some point. Wow, I'll say.. Look into vacuum leaks, dead MAP sensor, O2 sensors, ECT sensor, and dirty fuel infectors if you haven't already. Did you guys also noticed the nice set of turbine wheels under that salvage wagon. I,ve done that, pretty satisfactory. I used Sherwin-Williams, to scan, mix and make up aerosol cans. And not too bad price wise- under $20 for aerosol can, which seems to go much farther than the shelf variety from Duplicolor, etc.